Willy Russell’s heart-warming comedy Shirley Valentine premiered in 1986 and took the world by storm. In celebration of its 30th Anniversary the first major revival of this national treasure has embarked on a UK tour which comes to Cardiff’s New Theatre from Tuesday 27 June – Saturday 1 July 2017. 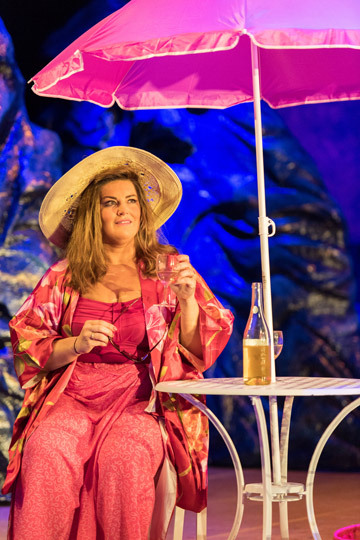 It stars the ever-popular Jodie Prenger as Shirley Valentine. Jodie Prenger last visited Cardiff in 2016 with Tell Me on a Sunday and is best known for winning the role of Nancy in the West End production of Oliver! through the BBC television series I’d Do Anything. She also played the title role in the national tour of the musical Calamity Jane and has starred in One Man, Two Guvnors both in the West End and on tour and as Lady of the Lake in Spamalot. Jodie is also a regular presenter on BBC Radio 2. In the comedy Jodie plays Shirley, a Liverpool housewife. Her kids have left home and she makes chips and egg for her husband while talking to the wall. Where has her life disappeared to? Out of the blue, her best friend offers her a trip to Greece for two weeks and she secretly packs her bags. She heads for the sun and starts to see the world and herself very differently. Shirley Valentine is penned by Willy Russell. With a career spanning over four-decades he is undeniably one of the most successful playwrights of his generation. His plays, including Educating Rita, Blood Brothers (at the New Theatre in September 2017), Our Day Out and Shirley Valentine, have been performed across the globe and have won countless awards, they continue to be in constant production throughout the world. Shirley Valentine was adapted into an Oscar nominated film starring Pauline Collins and Tom Conti. Shirley Valentine plays at the New Theatre from Tuesday 27 June – Saturday 1 July 2017 at 7.30pm plus Thursday and Saturday at 2.30pm. Tickets are from £10.50 – £31.00*. For further details and to book tickets visit newtheatrecardiff.co.uk or call the Box Office on (029) 2087 8889.